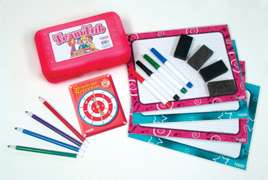 Team supplies include: 4 dry erase AnswerBoards, 4 color dry erase markers, 4 mini felt erasers, 4 twist-up crayons, and 1 Student Selector Spinner. Regular price $152. Combo price $99 • CCSTUB Save $53! We know Kagan gives you that warm, fuzzy feeling. Now you can be literally warm and fuzzy in your Kagan fleece jacket. See size chart below for codes. Not available in this size. Core curriculum has never been more fun or engaging! Each student team receives a double spinner and a deck of cards. One student draws the top card and spins the Subject spinner. It picks a subject, either Math, Science, Language Arts, or Social Studies. The student looks at the chosen word on his or her card. For example, if the Subject spinner landed on Math, the chosen word might be Right Angle. Next, the student spins the Game Action spinner. It chooses one of six different brain-friendly ways for the team to deepen their understanding of the chosen term. For example, the spinner lands on "I Draw, You Guess." So the student draws a right angle for the team, and they guess what it is. The six Game Actions will have your students acting, drawing, teaching, defining, and applying need-to-know core curriculum terms. 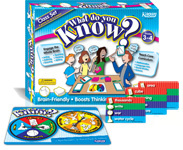 Boost vocabulary and thinking skills with this brain-friendly learning game! Each class set includes 8 card decks and 8 spinners, enough for up to 8 teams to play at once. Squish 'em. Squeeze 'em. Toss 'em. Pass 'em around. Dress up your desk. These relaxable foam apples, balls, brains, and lightbulbs are the teacher decorations with a function. Give 'em a squeeze to release the stress of "one of those days." Also a safe visual cue for students to toss around in their teams to see whose turn it is to answer, share, read, write, or solve the problem. Teambuilding and classbuilding have never been so easy! 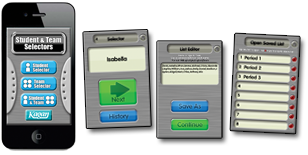 This software combines the ease of ready-to-use questions with the power of full interaction structures. Lead your students through teambuilding and classbuilding by simply clicking through the steps of the structures provided. Students have fun, get acquainted, and celebrate each other. Teams and classrooms become a supportive environment, optimal for learning. The Teambuilding version features Spotlight and Timed RoundRobin, two team-based interaction structures. The Classbuilding version features Mix-Pair-Share and Travel-N-Tell, two structures to promote positive classmate interactions. Choose from 20 unique question sets in each software to create teambuilding and classbuilding activities with zero prep, or make and save your own question sets. For PC, Mac, interactive whiteboards. Get both programs together and save big! Regular price $98. Combo price $79 • CETBCB Save $19! Software also sold separately and as site licences. Call for volume pricing. Create engagement—instantly! Just add your own questions. Using game-like structures, Instant Engagement leads you and your students through step-by-step instructional strategies for review, thinking and discussion, idea generation, and problem solving. There are 3 different programs in this series: 1) Pair, 2) Team, and 3) Class. Each program includes three structures designed to cover the range of classroom objectives. Use Quiz-N-Show for pair review sessions to boost test scores in any subject. Use Mix-Pair-Share to have your students mix to the music and then pair up with a classmate to discuss the prompts you enter—from what they did last weekend to the Theory of Relativity. Use ThinkTank to promote higher-level thinking and in-depth discussions in teams about your curriculum. Learning becomes fun, not a chore, with these interactive strategies. Good teaching is a snap! Whether you know and love Kagan Structures or you're just looking for a way to step up student engagement in your class, you now have the perfect tools to engage every student, every time. Get all 3 programs together and save big! Regular price $147. Combo price $119 • CIE Save $28! For complete product description, demo, and more info, click here.